Hire a hand held or stand mounted core drill with a range of bits from 52mm to 152mm. 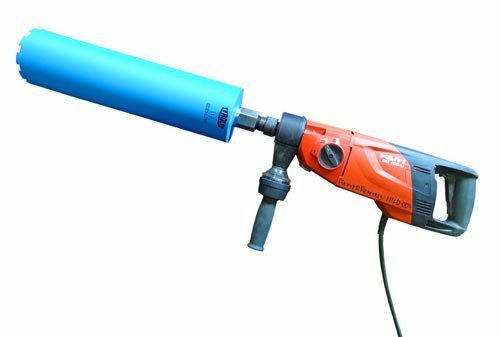 A diamond core drill – either hand held or with a stand – for holes from 52mm to 150mm. 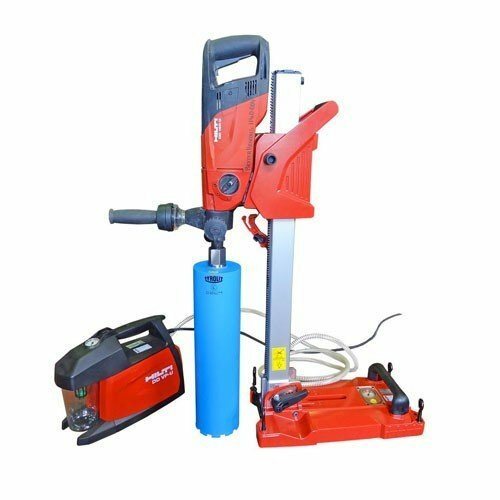 Concrete Core Drill Hire from Better Rentals..
will get you great results with a minimum of fuss. From a hand held core drill with a small diamond bit to a core drill with stand and a 152mm diamond core bit our range covers everything. Well everything between 52mm and 152mm. What size core drill bit should I use? The sizes are a couple of mm above the size pipe you may have as pipes quote the inside diameter so you’ll need a few extra mm to get the pipe through – eg 152mm for a 150mm pipe. All our core drills are the best available. We’ve tried other brands but Hilti seem to be the best. The short answer – just use water unless you’re inside and it’s going to make a mess. Then you need to work out a way to vacuum up any slurry before it spreads if the concrete is “hard” and requires water. Because if the concrete is particularly hard (isn’t all concrete hard?) the diamond will get hot, the core drill diamond smooths off, stops cutting but keeps wearing so you get an excess use charge and no hole (or one that takes a long time to cut). If you use water – only a dribble is needed to cool the bit but not too much to wash the slurry away as it keeps the diamond exposed if the concrete is particularly hard.